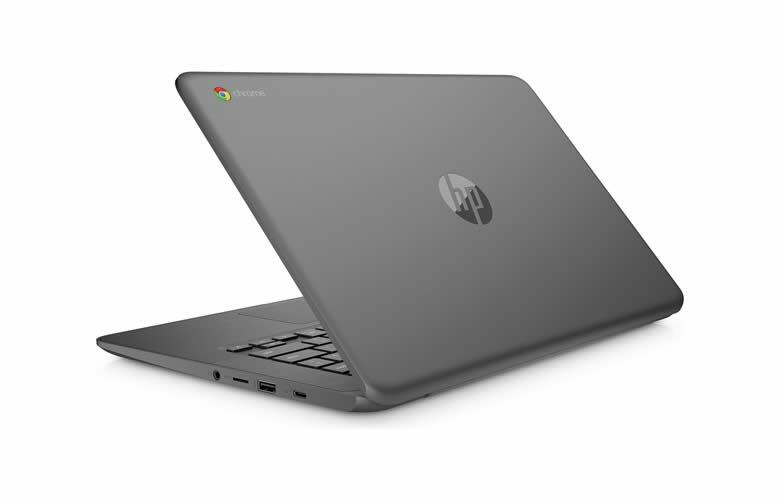 The HP Chromebook 14 G5 is one of the latest Chromebooks launched by HP. It was launched at the same time the smaller HP Chromebook 11 was released. Let’s take a closer look to see what this Chromebook has to offer. The HP Chromebook 14 G5 is a great budget laptop. If you're after a laptop to do day to day tasks but also want a great display then this is the Chromebook for you. It's also capable of running Android Apps and the 4GB of RAM is more than enough for the casual user. The HP Chromebook 14 G5 looks like any other laptop out there. When Chromebooks were originally launched some of them had an awkward look. They did not look like what you would expect from a laptop and they had a cheap in appearance. This Chromebook has none of these problems. It comes in slate grey and looks rather cool with its minimal design. The HP Chromebook 14 G5 uses the Intel Celeron N3350 processor. This dual-core processor provides a clock speed of 1.1GHz with a 2.4GHz turbo boost. It also comes with 2MB cache, which helps to speed up regular tasks. If you’re looking for a Chromebook to surf the internet or for word processing then this Chromebook will be a good choice. You’ll also be able to stream movies on this Chromebook without any problems. 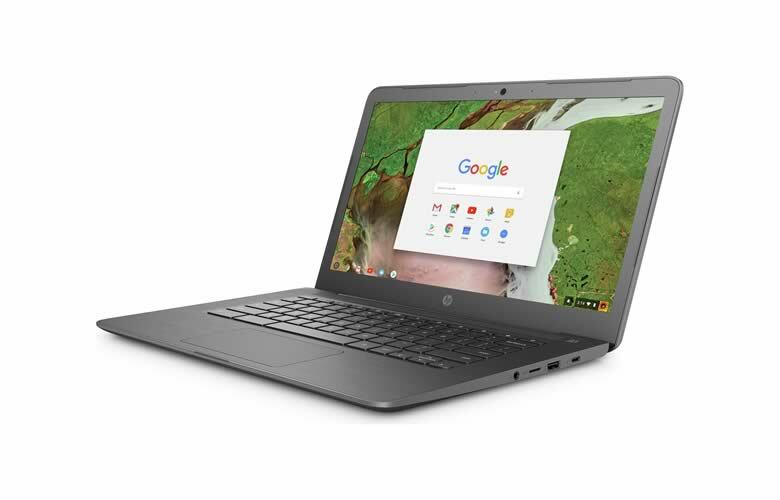 It’s worth remembering this is a budget Chromebook, so if you’re looking for a Chromebook that can do more rigorous tasks then the processor may struggle to perform. You’ll only notice issues if you need to edit large image files or need to work on multiple tasks all at once. It’s unlikely the Chromebook will not be able to perform most tasks, but you will see a slow down in performance if you like multitasking and expect an instant response. When it comes to using Android Apps you should have no problem using most of the Android Apps available. The HP Chromebook 14 G5 comes with 4GB of RAM. This is more than enough memory to do day to day tasks and to use your Chromebook to take advantage of Android Apps from the Play Store. Whether you’re internet surfing, word processing or number crunching on a spreadsheet the 4GB of RAM should be able to cope without any problems. A Chromebook with 4GB of RAM at the moment is perfectly acceptable. Later, when Linux Apps become available on the Chromebook. You may find that the 4GB of RAM causes your Chromebook to slow down on some tasks. If you’re using your Chromebook to edit large image files you’ll notice the Chromebook may struggle, but we’re talking about editing image files that are huge in file size. The storage you get with this Chromebook at 32GB is more than enough for most people. It’s definitely enough for anyone buying a Chromebook for day to day tasks. The good thing with a Chromebook is that it was designed to be used with the cloud. So if you use a cloud service such as Google Drive to store your work. You should have no problem at all with this amount of storage. Installing a lot of Android Apps on this Chromebook should not cause you any issues. Android Apps vary in size, so it’s not possible to say how many you can install. However, when you consider most apps only use between 20 to 50Mb each. You’ll be able to store a lot of Apps without any concerns over storage. The display on this Chromebook is what makes it stand out for a budget Chromebook. The 14-inch display boasts full HD with 1,920 x 1,080 pixels. The display also comes with anti-glare, which makes it perfect if you’ll be using your Chromebook in direct sunlight. The Display also features IPS, which makes everything look so much better than a display without IPS. It also means you should not come across any problems if you look at your display from an angle. Displays without IPS can be hard to see if you’re not positioned directly in front of the display. When it comes to buying a Chromebook, making sure it comes with IPS is something you’ll not regret. It also comes with touchscreen capability, which is great now you can use Android Apps on your Chromebook. A lot of Android Apps work much better with touchscreen gesture. Having a Chromebook with a touchscreen will make using Android Apps a joy to use. The HP Chromebook 14 G5 comes with a battery that can last up to 11 hours from a single charge. More than enough to see you through a whole day when you’re out and about. The HP Chromebook 14 comes with full support of Android Apps. This is great to see because Android Apps have taken some time to launch for the Chromebook. You should be fine using most of the Android Apps that are currently available. If you’re into gaming, it may struggle with more advanced games that require a lot of processing power. For everything else, you should not come across too many problems. The HP Chromebook 14 G5 does not disappoint when it comes to connectivity. It comes with Ethernet should you wish to use a more stable internet connection at home. It also comes with two USB 3.1 ports, which provides twice the transfer speed that you’d get from USB 3.0. It also comes with two USB – C ports, which is really good to see. The future of USB is type C, so it’s good to see you get two of these ports on the HP Chromebook 14 G5. 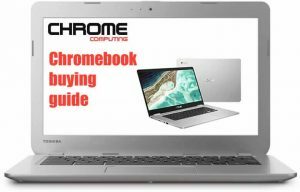 If you’re looking for a budget Chromebook that can easily handle day to day tasks then this may be the right Chromebook for you. The great thing about this Chromebook is its design. It will not look out of place when using your Chromebook on the move. It’s also got a great display, so if you want a laptop that can provide a Full High definition image you’ll not be disappointed with the display on offer here. A Chromebook in this price range with IPS technology is not something to overlook. If you’ve not owned a laptop with an IPS display before you’ll definitely notice the difference immediately. You get a much sharper crisper looking image and you’ll have no problems with viewing the display at an angle. The RAM and storage are perfectly fine for a Chromebook in this price range. You should have no problem storing lots of Android Apps and the RAM will be able to cope with most tasks you throw at it. If you’re looking for a Chromebook that will cope with Linux Apps in the future, then this Chromebook may not live up to expectations. The Intel Celeron processor will struggle if using Apps that require a lot of processing power. 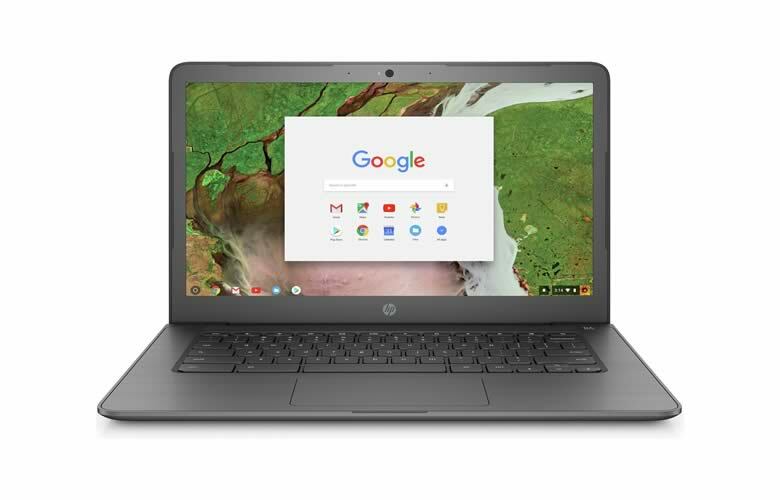 This is a great budget Chromebook for anyone looking for a Chromebook with Android Apps capability. Add to this the great screen, nice design and enough RAM and storage for dipping your toes into Android Apps. 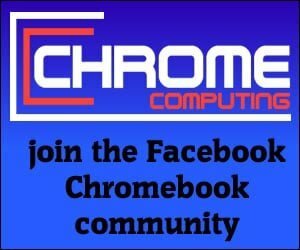 This may be the best budget Chromebook with Android App capability available.